When Maddie was not much older than Annabel is now we took her on our annual family trip to Arizona to relax and take in some spring training baseball games. Maddie had a great time playing with her cousins and even went to a game or two, but what she REALLY loved was looking into the floor length mirror in our hotel room. She would peer at the girl staring back at her and laugh and laugh. It was so cute to watch. Maddie was mesmerized – totally in love with her reflection. Lately I have been reminded of Maddie and that hotel mirror a lot because Annabel has started to act the same way whenever she finds herself in front of a mirror. She stares at herself and laughs and laughs, every bit as in love with her reflection as Maddie was. Unfortunately, as much as I wish she would always be so pleased with what she sees in the mirror, I know that is highly unlikely. When do we all stop loving the reflection we see in the mirror? When do we start to overlook our beauty and see only our faults? When does a mirror cease to be a source of joy and become something to avoid? It’s heartbreaking to think that sometime in the future I might find Annie staring at herself in a mirror with sadness instead of joy. If that day does come, however, I will tell her to smile, because I will always find her reflection as beautiful as she thinks it is now. I see it beginning with my 7 year old, Grace, and it breaks my heart. Apparently bitchiness is starting as early as first grade these days, and my super sensitive little girl is learning that although she loves herself and we love her, not everyone will even like her. We’re work hard to teach her those outside opinions are less reliable or important. That’s so heartbreaking. I have an 8 month old daughter and I live in fear of that day. Gorgeous pictures, but even more beautiful is your hope that Annabel will always see beauty. I love how similar your girls are – both loving the same things, easy to smile and laugh, etc. We all hope our daughter will love themselves in the mirror but you’re right, it’s difficult to prompt self love when all our girls see is size 0 models. You just have to instill all the confidence you can in him/her and remind her as often as you can she is beautiful inside and out. At least that’s what I do with my daughter and usually it works but there are always those days when a peer will say something so cruel and hurtful to her, it cuts you JUST as much as it cuts her. Those are the days we hope our life lessons will really come into play as we take our child into our waiting and open arms, we remind them they are as beautiful on the inside as they are on the out….and that’s a whole lotta beauty! Maybe we begin to focus on our faults because we have to learn how to accept what we can and cannot change. And then go for broke with being the best we can be…and then, aside from our parents loving us unconditionally, someone else will come along and loves us more than we love ourselves…it works! THIS is beautiful. Thank you. Its a great reminder to appreciate our reflection for it is not only us but the reflection of those who gave us life. It’s hard not to spot our faults in the mirror. We all need to be gentler on ourselves!! We are all beautiful in our own special ways. Lovely thought….something we should all remember. Beautiful post, Heather. It brought tears to my eyes. Take it from someone who is raising 5 daughters (three of whom have reached or left teenagerhood) – she will one day not always like what she sees in the mirror. She is a girl; that is par for the course. Don’t be heartbroken for her, just say what you wrote above, and it will help – even if she says it doesn’t. I have a feeling Annie is going to always be a big daddy’s girl. Make sure she knows her mommy loves what she sees in the mirror and you’ll be well on your way to Annie believing in herself throughout her life. This post is so sweet. Everyone questions their looks at some point, but it helps to have parents who instill confidence, affirm inner and outer beauty, and teach that not everything in life is about looks. Annie is in good hands! Sadly I think it’s starting younger and younger but I like your plan. I think your positive attitude now will help her in the future! awww you’re such a great dad and I already see you’re going to be very understanding. Don’t ever loose that, many girls aren’t so lucky. When do we stop enjoying our reflections? I’ll have to watch for that with my own little one. Beautiful post with wonderful sentiments. I was thinking lately that when I have a baby I might just play on repeat Born This Way by Lady Gaga. It has such a wonderful message and I would always emphasize the point that god makes no mistakes and you are born the person you were meant to be and you will always be beautiful to the people that love you and really, that is all that matters in life. When she grows up and passes the horrible teenage akward years she will realize that people come and go but your family and friends that truly become family are the only people that matter in life and they will make you confident in yourself. Mike, you’ll never know how important it is to let Annie know how you feel about her – write her letters/cards, let her know how proud you are of her, always communicate to her how beautiful she is, why you love her, and never, ever stop telling her that you love her! I wish I could have heard my dad say, “I love you” to me more often. I wasted a lot of years seeking my Dad’s approval growing up. It means a lot to a young lady trying to find her way in the world. You’ll do great!!! You nailed it JT! Dads can either build their daughters up or break them down with just a few simple words. If you tell her she’s beautiful and that you love her “just the way she is” and that you are proud of her, it will go a very long way. I too wasted many years growing up and trying to get my Dad’s approval. Even though she might roll her eyes and say “oh, Dad!” keep at it because it means more then she will ever be able to tell you! Especially when she’s a (pre) teenager and she doesn’t always feel pretty or loved! You’re the guy in her life by which all others will be judged. Just love her up! Beautiful post! She will definitely be a confident young lady because you will make sure of that. My mom always encouraged us by saying “damn you look good” every time we looked in the mirror. I in turn say that to my kids. might sound conceited, but hey…it worked for me and works for them. Keep doing what you’re doing… you’re doing great! Annie is gorgeous! Both your girls are beautiful. I know you will ensure they always know that. Always remind her she will be your little girl. No matter how old she gets, no matter what she says to you (because she won’t mean it, no matter how mean it is, no matter the anger in her voice when you say NO she can’t date that kid with the long hair and 20 tattoos and a motorcycle), just keep telling her she’s your little girl. I’m going to be 29 this month. And my dad said to me the other day it doesn’t matter how old I get, it doesn’t matter when I get engaged or married, I’ll always be his little girl. I think it must be shortly after high school graduation. LOL – at least that is the last time I remember liking my reflection! Maddie reminds me a bit of my youngest. Not an extra ounce of meat on her. She’s tiny and mighty. Finding a way to build up my daughters is something I worry about a lot. I don't want them to be plagued by their appearance and to love what they see. And finding ways to do that is hard. It is sad that we seem to lose that ability to just smile and laugh at our reflection in the mirror. I reading stories about Annie following in her big sister’s footsteps I hope she continues to love her reflection and can always smile and laugh at herself. 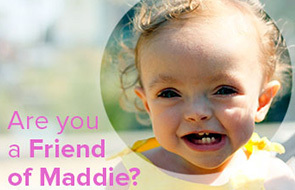 Maddie and Annie are both beautiful – along with your post. Thank you for sharing. Take care. It will be a heartbreaking moment (one I too hope never happens). But all you can give is your love. You’re truly a wonderful father. Thank you for being a real man.